water | laughin' in the rain.. There are so many blogs about what people eat and cook and like and what’s healthy but I never really hear about the drinks. Some background on me… my mom is a coffee fanatic. Her whole family is. Us kids grew up with warm milk with a little coffee in our bottles! Now, my dad.. he loves his Mountain Dew and drinks it all day. Offer him a cup of coffee after 10am? He declines stating he won’t sleep for week. Try to make sense of that! So put the two of them together and you get me… a full-blown coffee and soda addict at the age of 10. While I was in high school I worked as a barista in a locally owned coffee shop to support my habit. I exaggerate but to be honest I don’t even notice the effect of caffeine unless I don’t have it. I usually will get a headache on day two and realize that I haven’t had coffee and I pull into the closest Starbucks, chug a Grande iced coffee and away the headache goes. I’m not so worried about my coffee because I’ve pretty much gotten down to one or two cups of black coffee a day (the second if I’m dragging and have class or studying to do). The soda was another story. I’d drink a couple of glasses a day. Then I started to really worry about this neon green liquid full of sugar and chemically engineered ingredients and cut it out. I started mixing 100% juice with sparkling water and then switched to water. It really is amazing what happens when you stop drinking soda. You kind of deflate. It’s been a couple of years now but I’ll have a glass sporadically (movies!) but really can’t stand the sweetness. So, on a normal day, I have my coffee in the morning with water, a glass of green tea around 10am, and then water the rest of the day until I get home from work then I either have a glass of iced mango tea (TJ’s black mango tea – oh so good!) or a glass of wine. Then it’s back to water until bed. Sometimes a glass of skim milk with cookies sneaks its way in but I can always use the calcium. 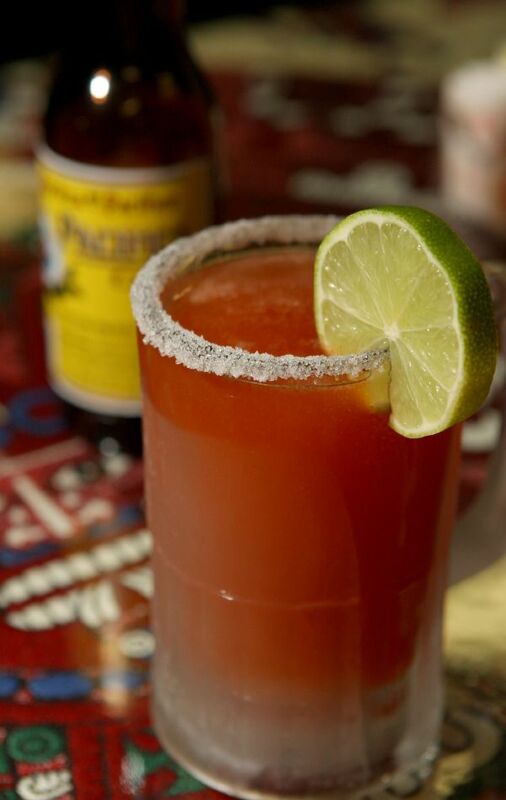 When we go out to eat I usually have wine (Merlot or Pinot Grigio) or I get a Michelada! So what do you drink throughout the day?